← Let’s Recharge the Troops and Double a Donation! I am your Battalion Buddy! while Mommy or Daddy is away! Having already shipped more than 600,000 care packages to service men and women deployed in combat zones, Operation Gratitude is pleased to announce the launch of “Battalion Buddies” — a new program designed to serve and encourage the young children of deploying troops. 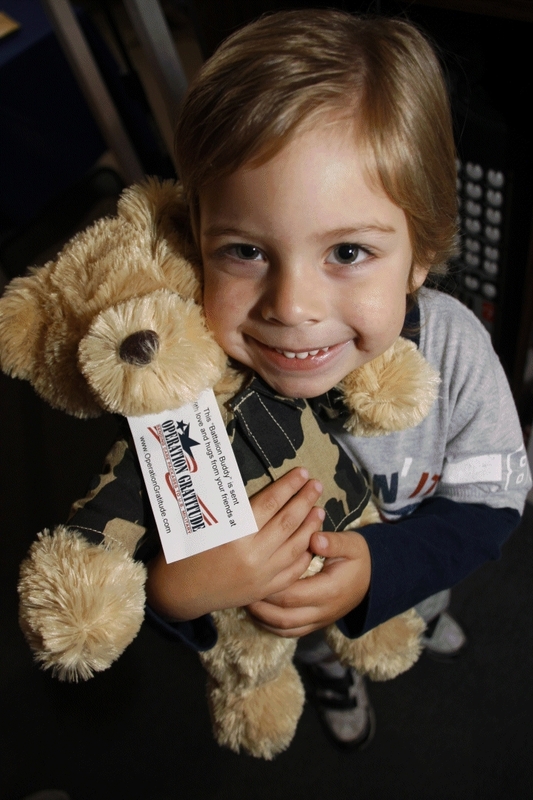 In cooperation with Family Readiness Officers and battalion leaders nationwide, Operation Gratitude will begin providing special stuffed toys – known as Battalion Buddies – to the sons and daughters of U.S. military personnel as their units prepare to deploy. 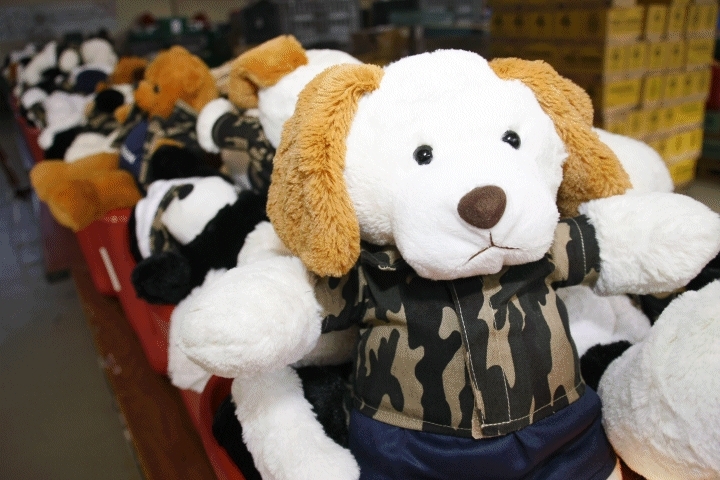 Aided by an initial donation of 28,000 stuffed toys hand-made by employees of the McKesson Corporation, and a follow-up donation of the cards by Tobu Print Group, Operation Gratitude was inspired to provide Battalion Buddies by the Commanding Officer of the National Guard armory in which the group operates. LTC Angel Ortiz, seeing the McKesson stuffed animals during a recent Care Package Assembly, asked whether Operation Gratitude could donate some for his units that would soon deploy. 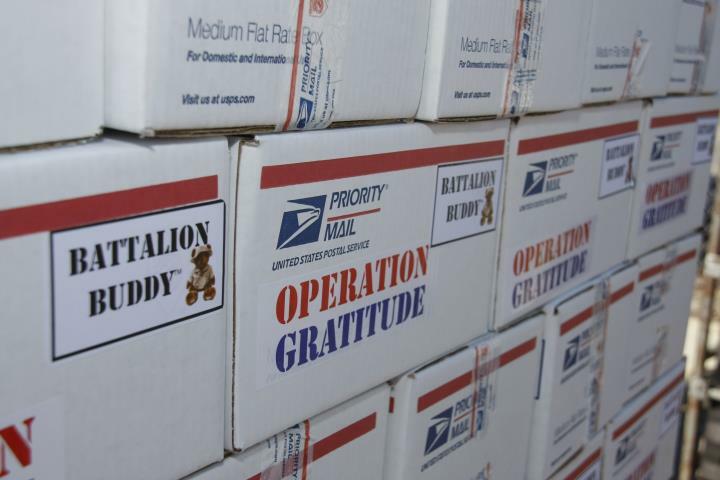 As with its Care Packages to deployed troops, Operation Gratitude’s Battalion Buddies program will provide every American opportunities to encourage the children of troops serving in combat by making financial donations to purchase and ship Battalion Buddies. THANK YOU for your generosity and support — we couldn’t do what we do for the troops and military families without YOUR HELP! This entry was posted in Uncategorized and tagged Afghanistan, Army, Battalion Buddy, Battalion Buddy Program, Beanie Babies, charity, combat, community service, corporate donations, deployment, donate, donations, Family Readiness Groups, Family Readiness Officers, gifts, Heroes, Libya, Marines, Middle East, military, Military care packages, military children, military families, Military support, morale, OperationGratitude, Patriots, plush toys, pre-deployment, stuffed animals, troops, U.S. military, USAF, USMC, volunteer. Bookmark the permalink. I was wondering how to go about gettig these bears for the children of the Delta Troop 1st 98th CAV out of kiln ms. Our troops are deploying this year and I know this would be a great thing for the children to hold and hug while their parent is deployed out of country. Please send an email to Info@OperationGratitude.com (and cc Ann@OperationGratitude.com) and we’ll get you the info you need. 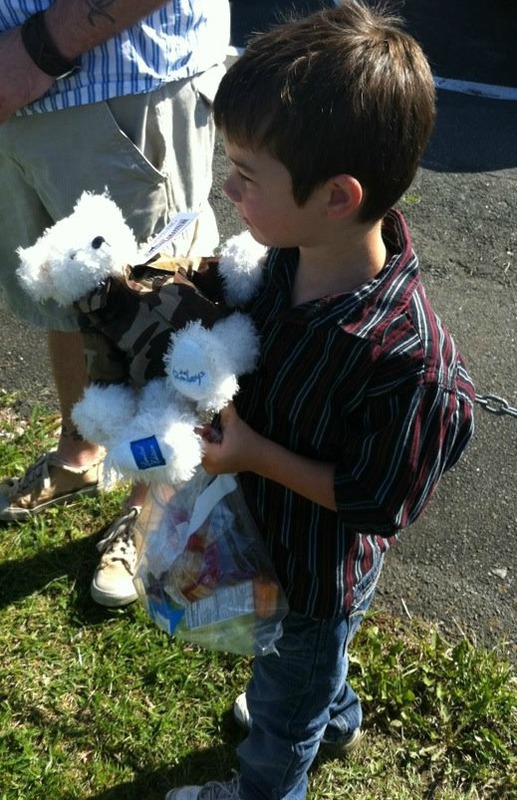 So is it just a donation that we can send to the battalion buddy or can we donate stuff animals to be battalion buddies? This is awesome. Thank you for all you are doing. My husband has been in the U.S. Army for 15 years. We have 7 children and our family has been through 6 deployments. These would have been wonderful to have. My husband is an instructor at the moment so he will not deploy. But when the next one comes up I will be sure to check this out. I shared your link to all my friends. Thank you again for all the support you are providing. You guys ROCK! I wish my children could receive Battalion Buddies but my husband deployed as an Individual Augmentee on his own so I have no unit to contact about coordinating this since there are no others that went with him. Ashley — have you sent an email to BattalionBuddy@gmail.com? It’s possible we might be able to work something out for your situation. We are looking forward to receiving our battalion buddies soon! My children miss their daddy. I thank God there are people/organizations who understand how difficult it is to have a deploying father/mother. We need the support. Let us support our troops and their families. I would like to say Thank You to all who contribute to Operation Gratitude/ Battalion Buddies! My husband deployed today and our daughters (6 years and 14 months ) were on the receiving end of Battalion Buddies. The bears were a well received gift and were cuddled the whole 3.5 hour drive home just after after leaving daddy!!! THANK YOU!!!! Thank YOU and your family for all that you are doing in service to our country! We are grateful to you all, and the Battalion Buddy packages is just one small way we can come alongside you during this time. We are very glad to hear that your daughters enjoyed cuddling with their new friends…! I reflagged this post because I’ve many friends who are military spouses or in the military themselves, they are a tight-knit community; but their children need all the support they can receive. They thank you from the bottom of your hears. This subject material is NOT on topic, AT ALL, but it is a good example of how we need support in all kinks of strife. Offer support to those who are in need. I live in a military town and have friends with spouses in the military. When mommy and/or daddy are deployed the children act out and this would be of comfort to the small children. I’ll have to pass it on! Thank you! We’d love to be able to reach out to more military families in this way — we are grateful for your help getting the word out! I love it! We are going through our first deployment and little reminders of daddy really help. I’m not sure my four year old really believes me when I say he is actually coming back. I’m sure these little cuddly guys will help a lot of children. I may just have to try my hand at sewing a bear. We are honored to be able to support military families in this way….Thank you for your kind comment! Thank you Battalion Buddies. My children received their Battalion Buddies this morning and have been playing with them every since. Your support and help is much appreciated. You are so very welcome, Tiffany! We are glad to know your children are enjoying their new Buddies! 🙂 We are grateful to your family for the sacrifices you are making in service to our country, and it is an honor for us to be able to support you in this way. Thank You! My children received a Battalion Buddy last night at their Halloween Party. My son woke up this morning still holding his Buddy in his arms. You made one very happy little Red Falcon! Tiffany, we’re so glad to know you son loves his Battalion Buddy! We are grateful to your whole family — it’s an honor to be able to support you. Thank YOU. Have you ever seen “Parapup” by Elisa Vertuli? It’s a great book to give kids who are dealing with deployment and comes with a puppy who brings letters/gifts back and forth between kids and parents. These dogs already have military clothing and come with the book. Another GREAT resource for military kids! Look them up on Facebook! Name is Parapup. This is a wonderful program Barb. Thank you for bringing it to my attention. I also wanted to let you know that I nominated you for the Versatile Bloggers award. Please visit my site The Christian Gazette http://thechrisitiangazette for instructions on how to pick it up. Loopy! I know you are getting a lot of animals, but the clothing probably does not come with the animal. Is there a pattern? I sew and could make some of this – it looks pretty easy. Thank you, Linda! You’re correct — the stuffed animals do not come with the cute clothing you see in many of our photos. We don’t have a pattern to share with you because the toys are different shapes and sizes and what works for one might not work for others. Thank you for your kind offer — if we hear of a “one size fits all” type of pattern, we will definitely post the information here. How can I get a contact phone/email for this? I’m FRG Secretary for my husbands unit and we are gearing up for another deploy. Stacie: Please email opgrat -at- gmail.com to request information and details. My Dad was a US Navy Sea Bee when I was a kid. They did not have anything at all like this. It definitely would have been a good program. Please let me know if there is anything that I might be able to assist you with to make this program grow and continue to run. God Bless you All, and All of Our Service Men and Women! Thank you for protecting us and our Freedom and Liberty! Thank you, Michael. We are just getting off the ground with the Battalion Buddies program — so far, so good! Donations of brand-new stuffed toys and finances to help pay shipment costs will be what we need most to keep it going. We appreciate your support! My Nephew, SSGT Rodriguez, Jonathan L., is currantly stationed in Afganistan, Marine Unit 73915. I was wondering if you would be able to send all the children in that unit a Battalion Buddy? It would mean a lot to me. Thank you for supportting our Troops. Janean, we’d be happy to send Battalion Buddies to the children in your nephew’s unit if we receive a request from the rear detachment and/or family readiness officer. Please have the command contact us via email — opgrat -at – gmail.com — so we can make arrangements directly with them for a shipment. Thank you! I am looking to see where i can get battalion buddies…i have 3 boys and their dad is about to deploy. Jennifer, we are happy to send Battalion Buddies to all the children of a deploying or deployed unit upon request from the rear detachment and/or family readiness officer. Please have the command contact us via email — opgrat -at – gmail.com — so we can make arrangements directly with them for a shipment. At this time, we do not have the resources to send the Buddies to individual children. Thank you for your understanding.